Lisa was appointed President and CEO of Celebrity Cruises in December of 2014, making her the first and only woman to lead one of Royal Caribbean Cruises Ltd.'s (RCL) cruise line brands – as well as the first and only female CEO of a publicly traded cruise line on the New York Stock Exchange. Lutoff-Perlo is a high-impact leader in the travel/hospitality industry. Her commitment to opening up the world through travel has brought recognition, awards and invitations for Celebrity Cruises to be applauded for their global impact. A champion for diversity, education and for young women to "raise their hand" as the next leaders of our world, Lisa leads by example by standing-up for what she believes in while encouraging others to do the same. As a leader, innovator and smart disruptor, Lutoff-Perlo raises the bar on all diversity and inclusiveness, removing barriers so that all may thrive. One of her first bold decisions as President and CEO was to hire the first American female captain of a cruise ship, and challenging leadership to raise the men/women ratio on the ship's bridge, crew and global staff. Her transformative leadership has redefined 'modern luxury' for Celebrity Cruises. Lutoff-Perlo seeks to open the world for guests with a deeper understanding of what makes a great guest experience: a wide variety of ways to experience compelling destinations, welcoming and unpretentious service, distinctive onboard experiences, and a unique approach to design, culinary and accommodations. 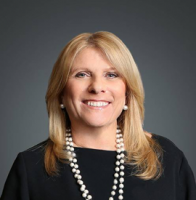 Lutoff-Perlo has held a variety of roles during her ladder-climbing 32-year tenure with Royal Caribbean Cruises Ltd. She spent many years within the sales and marketing organizations in varying roles and levels of responsibility, creating a deep understanding of the value of customers. Lutoff-Perlo actively participates in and lends her leadership to a number of regional, philanthropic and women's organizations. She has received numerous awards for her contributions to gender equality, diversity and inclusion, the travel industry and the South Florida business community.